Western Australia’s Jared Stone was named Australian Apprentice of the Year at the 2015 Australian Training Awards in Hobart on Thursday 19 November. Jared was among 16 winners out of 76 finalists, including Peter Henneken AM, who was awarded the Lifetime Achievement Award for over 40 years of service to the Queensland and national vocational education and training (VET) sectors. The Hon Luke Hartsuyker MP, Minister for Vocational Education and Skills, provided a keynote address at the presentation dinner. “All the award finalists have achieved amazing things thanks to VET, and are helping build a highly skilled workforce to help our nation remain competitive into the future,” Minister Hartsuyker told over 700 guests at the presentation dinner. The presentation dinner was held at the iconic Princes Wharf 1 and guests were entertained by Soprano Grace Ovens of the Conservatorium of Music in Tasmania and BEX, a trio of musicians from Hobart College studying nationally recognised qualifications in music. Winner, runner up and finalist biographies are available on the Australian Training Awards website. To view the online conversations about the Awards, search the social media hashtag #ATA2015 or visit the Awards’ Facebook, LinkedIn and Twitter pages. Held each November, the Awards are the peak national awards for VET, recognising innovation and excellence in VET. Many of the awards are the culmination of the state and territory training awards with winners from each state and territory competing in these national finals. Seven of the awards are available by direct entry to the national level. Don’t miss the Faces of Excellence section which features the 2015 award recipients! 2016 direct entry categories of the Awards open December 2015. For more information visit the website. Ministers and their representatives at the CISC meeting (L-R) – Parliamentary Secretary Nathan Barrett (NT), the Hon John Barilaro MP (NSW), the Hon Matthew Groom MP (Tas), the Hon Liza Harvey MLA (WA), the Hon Luke Hartsuyker MP (Cwth), Ms Joy Burch MLA (ACT), the Hon Yvette D’Ath MP (Qld) and the Hon Steve Herbert MP (Vic). The COAG Industry and Skills Council (CISC) meeting for skills Ministers was held in Hobart on 20 November, to coincide with the Australian Training Awards. This meeting was the first to be chaired by the Minister for Vocational Education and Skills, the Hon Luke Hartsuyker MP. An industry forum held prior to the meeting allowed Commonwealth and jurisdictional representatives to engage with members of Tasmanian business and industry to discuss issues surrounding foundation skills, skills shortages and technology. industry responsiveness and the work to date of the Australian Industry and Skills Committee. The next meeting will be held in Sydney in March 2016. The communique from the meeting is now available online. 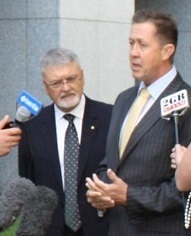 On 10 November the Hon Luke Hartsuyker MP, Minister for Vocational Education and Skills, launched the first Total VET Activity (TVA) report with Professor Peter Shergold, Chair of the National Centre for Vocational Education Research (NCVER) board. Minister Hartsuyker welcomed the release of the new report which captures, for the first time, the sheer scale and diversity of Australia’s Vocational Education and Training (VET) sector. He reflected that Australia was a learning nation, with 3.9 million people undertaking VET studies in 2014. 2014 was the first year of TVA reporting and the release of this comprehensive data set of all nationally recognised training by all RTOs is a significant milestone. Skills Ministers from across the country came together for the COAG Industry Skills Council meetings in Hobart on 20 November. Ministers acknowledged the TVA release as a significant improvement in the availability of information on the VET sector. They also acknowledged that it was only achieved with the cooperation of all governments and the involvement of VET providers, and they particularly appreciated the efforts of private providers submitting data for the first time. Access the Total VET Activity data and read the Media Release and transcript of the launch. 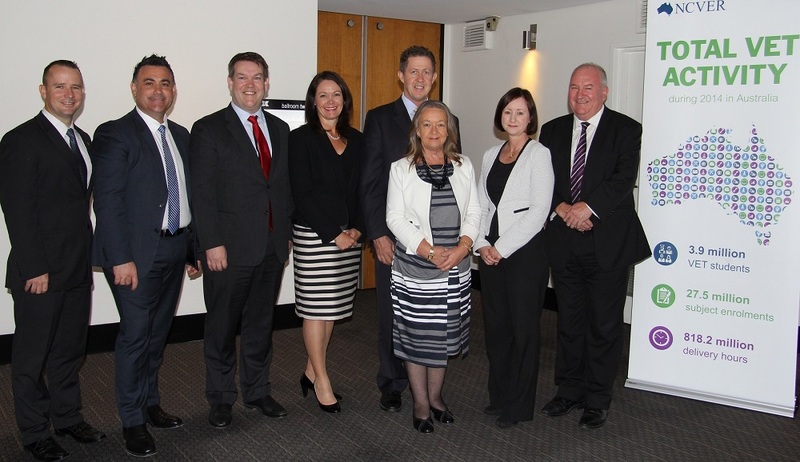 The Australian Industry and Skills Committee held its fifth meeting in Hobart on 1 December 2015. The communiqué is available online. The Department of Education and Training is undertaking a competitive expression of interest process to identify organisations to operate as Skills Service Organisations (SSOs). A key objective of this process is to introduce contestability and strengthen industry leadership in the new system. Under the new arrangements for developing training packages, Industry Reference Groups (IRCs) will drive training package development. They will be supported in this work by SSOs. SSOs will support a range of IRCs by providing technical, operational and secretariat activities to enable those IRCs to undertake their industry engagement and training product development and review activities. Decisions about the content of training packages to be put forward for approval will be the responsibility of the IRC. SSOs are expected to be operational from January 2016. Quality outcomes from vocational education and training are fundamental to ensuring a skilled workforce and supporting a productive economy. In a competency-based training system, assessment is the gatekeeper for quality. To ensure high quality within the system, the Council of Australian Governments Industry and Skills Council (CISC) agreed that further reform options be developed to improve the quality of assessment of student training outcomes. CISC agreed that Minister Hartsuyker will consult with VET stakeholders and jurisdictions on options to improve assessment in VET and report back to CISC with possible reform options in 2016. Priority areas for investigation include strengthening skills of VET trainers and assessors, consideration of improved validation of assessment, including greater industry involvement, and options for tougher regulatory interventions. To support consultations, the Department of Education and Training will release the Quality of assessment in vocational education and training – Discussion Paper on the department’s website from mid-December 2015 to mid-February 2016. The Australian Government has introduced new repayment obligations for Aussies living overseas who have a Higher Education Loan Programme (HELP) or Trade Support Loan (TSL) debt. This will make the system fairer for everyone by ensuring that all Australians with a HELP or TSL debt are treated the same. Until now, people who took out a HELP or TSL loan and moved overseas were under no obligation to repay their debt as long as they remained offshore residents. Now, anyone who has a HELP or TSL debt, who earns above the minimum repayment threshold, will repay their debt regardless of where they live. • From 1 January 2016, people with HELP and TSL debt who move overseas for six months or more will be required to notify the Australian Taxation Office (ATO). • From 1 July 2017, people with HELP or TSL debt who are non-residents for tax purposes will be required to assess their total Australian and foreign-sourced income in order to make income contingent repayments. This will start from the 2016-17 financial year. If you have a current HELP or TSL debt (including those who have already graduated from study but are still paying off their debt) register for a myGov account and link your account to the ATO so that you can be contacted for updates and reminders. This is because, from 1 July 2017, if you are overseas you will use your myGov account to lodge an assessment of your world-wide income. Using your myGov account, you can view your HELP debt online, confirm your payment reference number (PRN) and view payment options. The Minister for Vocational Education and Skills, the Hon Luke Hartsuyker MP, has welcomed the signing of a memorandum of understanding (MOU) between the Australian Skills Quality Authority (ASQA) and the Council for Private Education (CPE) in Singapore. Minister Hartsuyker said the MOU would provide the foundation for the two regulators to work together to ensure those undertaking formal Australian vocational qualifications in Singapore receive high quality training and assessment. ASQA is the national regulator for Australia’s vocational education and training (VET) sector while CPE was established in December 2009 to regulate the private education industry in Singapore. Chief Executive of CPE, Mr Brandon Lee, anticipated that the partnership would lead to greater insight into the developing trends of the VET sectors in both countries. Australia and Singapore entered into a Comprehensive Strategic Partnership on 29 June 2015 to elevate the bilateral relationship between the two countries. In support of this new Partnership, the two countries agreed to implement a ten-year roadmap of joint practical actions (Project 2025) to deepen cooperation in economic, foreign affairs, defence and security and people-to-people fields. The Department of Education and Training is actively involved in the DFAT-led development and implementation of the roadmap. The recent signing of the MOU between ASQA and CPE will contribute to the roadmap process, particularly in increasing links between education authorities, exchange of information and sharing of good practices in regulation and quality assurance in vocational education and training. Have you been thinking about a change in your role or occupation? Find out about the training pathways available to you and how to make that move towards a promotion or into a new job. Never thought about it before? Speak to one of our providers and find out what kind of roles will be in demand and how you are placed to take advantage. The Department of Education and Training is offering free career advisory services for employed people aged 45-54 years. Services will be available in NSW, ACT, VIC, QLD and WA for the six month pilot commencing mid-November 2015. Our providers will work one-on-one with you to identify your skill levels, interests and experience to put together a Career Plan setting out pathways to further employment or training and education to achieve your goals. For further information, including how to apply, visit Skills Checkpoint Pilot. The Industry Skills Fund (the fund) is an Australian Government programme that provides eligible businesses with access to training so that they are better placed to succeed in a rapidly changing economy. Offering over 250,000 training places and support services for industry, the fund is targeting SMEs, including micro businesses, which are preparing to take up growth opportunities outside of their normal day-to-day business operations. In addition to training grants, the fund can also provide free independent skills advice to eligible businesses. The fund is a key part of the Australian Government’s programme of vocational education and training (VET) reform to lift the quality of both training providers and their courses, enhancing the contribution VET makes to the employment prospects of students and Australia’s economy. Large businesses and businesses repositioning due to market driven structural adjustment are eligible to apply. To find out more, call 13 28 46 or visit the website to complete a simple online enquiry form. The My Skills training directory was created to inform consumers about training opportunities and options. It also provides an easy and streamlined RTO login portal for RTOs to instantaneously publish information to help training consumers make better decisions. VET FEE-HELP RTOs are now required to publish their maximum prices for VET FEE-HELP courses on My Skills. RTOs can also provide unique descriptions of their courses to help users compare the same course offered by different RTOs. • add their organisation’s logo. Why is providing information important? My Skills search results prioritise RTOs that provide information for their courses. The more information RTOs provide, the easier it is for consumers to find them. RTOs can keep their details up-to-date by LOGGING IN NOW at myskills.gov.au. Enter your email address and press the reset password button. As an RTO, you are required to collect and verify a student’s USI before you can issue a qualification or statement of attainment, unless a specific exemption applies. You should remember these key points for easy management of the USI process! Inform your student of USI requirements prior to enrolment. Create or Collect the USI upon enrolment – Don’t forget to check if the student already has one prior to creating. Verify the USI at enrolment or as soon as possible! Report – Include the USI with your AVETMISS reporting. It is important to ensure that your students are aware of USI requirements prior to enrolment. Better informed students will have their USIs ready upon enrolment or prepared with relevant documents so that you can create one easily on their behalf. Don’t delay collecting the USI as part of your enrolment process as it will make managing your reporting requirements much easier! If you are planning to create a USI on behalf of your students, please ensure that you have sought their permission to do so prior to creating it. Once you have the student’s permission, use the LOCATE USI function to see if there is already an existing USI in the system. There may be times when they have forgotten their USI and it is important that you do not create a new one for them. Anyone who has enrolled in nationally recognised training since 1 January 2015 is likely to already have a USI. If possible, check USI details against the confirmation document supplied to the student or against the same ID document used to create the USI. Students should enrol using the exact name and DOB details used to create their USI. This will improve the integrity of your records as well as the integrity of the national training records. Once you have created a USI on a student's behalf, encourage them to then store their USI somewhere safe as it is theirs for life and you only need to create it once! Remember, you will still need to verify a student’s USI even if you don’t plan on creating a USI on their behalf. It is also important that you verify USIs at the time of collection wherever possible and before the student completes enrolment or as soon as possible afterwards. Follow up all missing or unverified USIs quickly with your students. System to system connectivity, between your student management system and the USI Registry System, enables you to create (with a student’s permission) and verify USIs through your own system. This allows for a more streamlined process. When you submit your data to the National Centre for Vocational Education Research (NCVER) according to the reporting requirements you must include a USI. Failure to do so may be a breach of your registration requirements. Transcripts for students will be available from mid-2016. In order to ensure that students have accurate data on their transcripts, it is important that your data submission is correct! If you are experiencing trouble connecting or understanding your obligations as an RTO, contact us on 1300 857 536. Australia’s finest young apprentices, trainees and students are gearing up for the ultimate trades and skills challenge, the 2016 WorldSkills Australia National Competition. Supported by the Victorian Government, the National Competition will be held at the Melbourne Showgrounds from 6 – 8 May 2016. Close to 500 competitors from all corners of Australia will compete in over 50 skill categories including Vehicle Painting, Bricklaying, Hairdressing, Programming, Cookery and Welding. The competitors’ journeys began at the WorldSkills Australia Regional Competitions held in 31 regions across the country. As the Regional Competitions draw to a close, stand-out competitors will be selected to progress onto the National Competition. Read more . . . .
From 17 – 19 May 2016 WorldSkills Australia will determine its first National Champions at the Air Conditioning Refrigeration and Building Services (ARBS) exhibition at the Melbourne Convention and Exhibition Centre. ARBS will be hosting the National Refrigeration Competition for the seventh time. Since first offered in the late 1980s, the challenge has yielded some amazing young talent including 1999 Skillaroo and Gold Medallist, Chris MacDonald and 2015 Skillaroo and Medallion of Excellence winner, Beau Kupris. Read more about the Refrigeration Competition. Discover Your Career has had a makeover and is waiting for you to visit and start your journey to finding a career in tourism and hospitality. The Tourism & Hospitality Careers Council (THCC) has just updated and re-launched the website. It’s now mobile and tablet optimised, and better integrated with Discover Hospitality and Discover Tourism. If you want to start a career in an industry identified as Australia’s next economic powerhouse, then Tourism and Hospitality is for you! Tourism is on track to be a $145.1 billion economy for Australia within 10 years! And with growth and success comes the need for staff of all ages and experience. Discover Your Career is the place to land and be guided through a myriad of job opportunities, pathways to careers, profiles of people already in the industry and a complete video library to inspire you. Rediscover Discover Your Career now. TAFE Directors Australia (TDA) and Australian Vocational Education and Training Research Association (AVETRA) are pleased to announce the third round of the joint Industry Innovation Scholarship. By providing $6,000 for an individual or group of practitioners to research innovative ways to work with industry or community to meet skill needs, the scholarship supports applied research between TAFE and industry. The scholarship commenced in 2014 and supports TDA’s strategic objective to position TAFE in a competitive training market, and AVETRA’s strong commitment to the development of research in VET nationally. Applications close on 11 March 2016 and those including co-sponsorship contributions by industry are strongly encouraged. Read more or contact Melinda Waters on (02) 9217 4951 or at mwaters@tda.edu.au. Over the past two years, ForestWorks has undertaken work to rewrite their industry’s skills standards and qualifications into a new format determined by the Australian Government. The new format will not require RTOs or industry to change their current systems and processes, but offers a clearer and simpler layout, designed to improve the quality of outcomes for industry. While the format has changed, the content has largely remained the same. All revised units, skill sets and qualifications are equivalent to present standards and RTOs’ scope will be automatically updated, with no anticipated impact on existing funding arrangements. CPSISC is inviting their valued stakeholders to participate in the 2016-2017 Stakeholder Survey. This survey collects intelligence to inform the development of CPSISC’s Annual Environmental Scan (E-Scan) and the development of VET products beyond 2016. As National VET Reform brings change, CPSISC industry and VET stakeholders need current intelligence to remain connected in an evolving new VET market. As industries are restructured and new occupations start developing, CPSISC will report the latest trends in the E-Scan report. Each survey returned is numbered and goes into a draw, with all respondents eligible to win a new Apple Watch valued up to $900. To be in the draw, you must submit your survey responses by 5 pm 18 December 2015 (AEDT). Should the format of the survey limit the specific detail you wish to provide, you can contact Dianne Dayhew directly at CPSISC on 0488 481 311 or at dianne.dayhew@cpsisc.com.au. The winner will be notified by email and their details published in the CPSISC newsletter. CPSISC is once again holding a round of free professional development workshops for RTOs in the construction and property services sectors. These free workshops will provide an important opportunity for RTOs to meet in a face-to-face environment to participate in discussions about the future of VET arrangements and impacts on Training Package implementation, as well as resources which can assist them to implement redesigned units of competency. For more information and to download a registration flyer visit the CPSISC website. To support delivery of this newly redeveloped unit of competency, CPSISC has developed a suite of resources to be available once the unit has been endorsed and released on training.gov.au. Available in hard copy, this new and improved pocketbook for learners will include key information about health and safety legislative requirements; risk management and construction hazards; health and safety communication and reporting; and incident and emergency response. Available in hard copy and electronic (for iPads), this customisable template provides a detailed delivery strategy, and assessment tools and resources, to support trainers and assessors in quality delivery and assessment of the unit. These resources will be in demand. In preparation for their release, CPSISC is collecting pre-orders. For more information, and to download the pre-order form, visit the CPSISC website. • 13 November 2015 - Community Pharmacy Components of the SIR Retail Services Training Package. The Case for Endorsement and the submitted components are available on the Service Skills Australia website to both inform and assist in the planning activities of stakeholders. The training package has been loaded on training.gov.au and will be available for release when formal endorsement notification is received. • 27 November 2015 – proposed components of the SIT Tourism, Travel and Hospitality Training Package and the supporting Case for Endorsement. The Case for Endorsement and the submitted components are available on the Service Skills Australia website to both inform and assist in the planning activities of stakeholders. The training packages has been developed adhering to The Training Package Development and Endorsement Policy and to meet the requirements of the Standards for Training Packages. They have undergone extensive industry consultation and validation and a full external quality review which deemed the proposed training packages compliant with these standards. Following the endorsement of the beauty components in September, the proposed components of the SHB Hairdressing and Beauty Services Training Package V2.0 and its supporting Case for Endorsement were submitted to the Department of Education and Training on 30 November 2015. • Graduate Certificate in Hairdressing Creative Leadership. The Case for Endorsement and the submitted components are available on the Service Skills Australia website to both inform and assist in the planning activities of stakeholders. The training package has been loaded on training.gov.au and will be available for release when formal endorsement notification is received. Service Skills Australia would like to thank all stakeholders for their time and feedback. For more information on any of these training packages, please contact trainingpackages@serviceskills.com.au or (02) 8243 1200. SkillsDMC is pleased to announce that the RII Resources and Infrastructure Industry Training Package was endorsed by the Australian Industry and Skills Committee on 1 December 2015. The training package is currently being published and will be available to view via training.gov.au shortly. IBSA's office will be closed from 25 December 2015 to 3 January 2016. Place and confirm your order before 11 December 2015 to ensure you receive it prior to Christmas. Read more . . . .
Velg Training is calling for presenters for the 2016 National VET Conference to be held at the Gold Coast Convention and Exhibition Centre. The conference theme is Celebrating VET and will focus on multiple streams including Policy and Reform; RTO Management and Compliance; Training and Assessing; VET Shapers; and eLearning. All submissions will be reviewed for their relevance to the theme and alignment to Velg Training’s mission statement to Educate, Inspire and Empower the VET sector. Submissions are due on Friday 29 January 2016 and applicants will be notified of the outcome on Monday 29 February 2016. To submit a presentation, access the 2016 Call for Presenters online application form. For more information, visit the Velg website or contact Dimity Redcliffe, Marketing, Conference and Events Manager on (07) 3866 0888 or at conference@velgtraining.com. Read more about these programs. Market your technical and vocational education courses to a substantial and growing economy in the Pacific Islands region. This TVET mission will focus on technical and vocational education training opportunities in Papua New Guinea (PNG). PNG has a significant programme to connect the country through new road infrastructure, airports and seaports. New investments are also being made in the hospitality sector and the economically significant mining, oil and gas resources sector. To achieve this development there is strong demand from local and international industry, as well as government, for highly skilled labour. The mission will connect Australian technical and vocational education service providers with the partners they need to successfully develop and deliver TVET skills programs within PNG and Australia. It will also provide participants with insights on how to operate successfully in an environment that while occasionally difficult, has great potential. To participate in the PNG TVET Mission 2016 submit an application on the Austrade website. For more details, read the event brochure or contact Max Umbu, Senior Business Development Manager, Austrade Port Moresby on +675 325 9150 or at max.umbu@austrade.gov.au. AITD are pleased to announce that influential learning experts Donald Clark and Ger Driesen will be keynote speakers at their Annual National Conference. The Conference is a highly regarded event for providing delegates with high quality, dynamic presentations on an exciting range of innovative topics. In 2016 the presentations will explore technology, learning strategy, innovation, social and collaborative learning, leadership, talent development and much more. Register today and save up to 40% off standard registration prices. Visit the AITD website to register and for more information. Watch the National Skills Week website in coming weeks for the announcement of the 2016 theme and other details. Considered one of the best value events on the VET calendar, No Frills turns 25 next year and NCVER is delighted to co-host the National Conference with CQUniversity. Previously known as Career Hunter, CareerMe provides up-to-date occupational information and highlights the industries where skills are most needed, allowing young people to make tangible links from school to the world of work. CareerMe enables job seekers of all ages to have employment information at their fingertips anywhere, anytime. The third Real Stories Real Achievements video series is now available. For more information about these inspirational journeys of career and business success through vocational education and training, contact the Australian Training Awards at australiantrainingwards@education.gov.au. For more information or to view sample pages please visit Aspire’s website or call (03) 9820 1300. Catapult eLearning at info@catapult-elearning.com or phone (08) 8275 9380. If you would like to provide feedback, supply an article for inclusion in the next edition or join our list of subscribers, please email skillsatwork@education.gov.au. The next edition will be published in February 2016. Submissions are due by Friday Friday 15 January 2016.